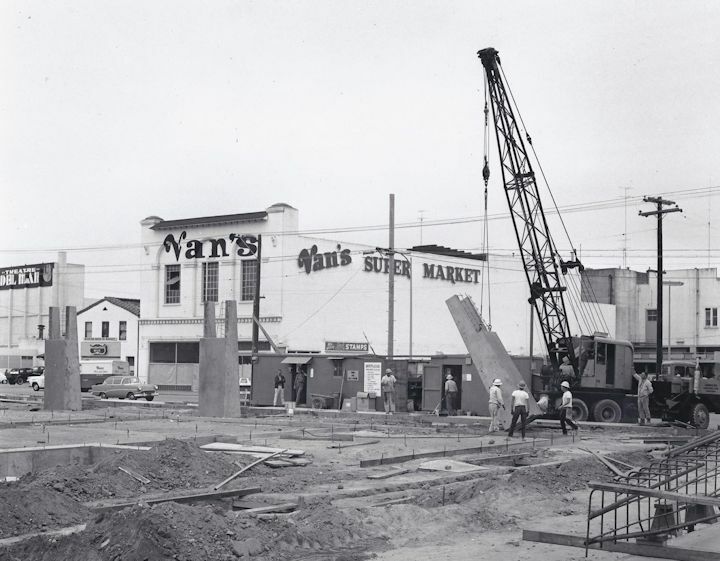 CONSTRUCTION OF CVS (LONG’S ) DRUG STORE. This was taken July 22,1965. You can see The Del Mar Theatre on the far left. Van’s Super Market in the photo is about where Oswald’s Restaurant and that ugly three story parking structure is located on Front Street. BY WAY OF EXPLANATION. I’m glad that so many folks wonder about how and why BrattonOnline is sometimes “late” and sometimes “right on the deadline date”. I write and finish all the words, pictures, links, edits, everything, by Monday afternoon. I send all of it to Gunilla Leavitt (my web person) owner of The Golden Fleece Emporium of Wonderment and Yarn Shop over at the entrance to the Sashmill. Gunilla is one busy woman. She runs the store, manages her family, and has been re-creating all my stuff online for, lo these almost 12 years. She gets to it as soon as she can…she does this for little more than a short song, so to speak. So sometimes BrattonOnline gets online on Mondays sometimes it’s later, but I always have made that deadline on Mondays. Now you know. Another thing don’t send any stuff to me at photo@BrattonOnline or Info@BrattonOnline. That just makes more work for Gunilla, send everything to me at bratton@Cruzio.com. I like Cruzio, and always have, so send all rumors, opinions and even facts to bratton@cruzio.com. Please. WELCOME TO SANTA CRUZ. Wish I could see a show of hands of how many people realize that all those horrible, terrible, adjectives that we Santa Cruzans now say about our homeless population…we used to say about Blacks, Mexicans, Jews, Chinese, and other humans we didn’t like?? WE HELP SOME OF THE WORLD’S STARVING. Africa, Cuba, India, Phillipines, you name it and there’s an abundance of American Agencies and lots of Santa Cruzans helping those poor people…but not our own homeless!!! What’s that about? Are they not human, do they not bleed? ENGINEERS STRIKE AT DOMINICAN DRAGS ON!!! Nancy Abbey of The People’s Democratic Club (PDC) sends this..The Engineers Strike at Dominican drags on – six weeks now for these 15 skilled workers who keep the hospital equipment and facility running. Dignity Health is still not willing to discuss the workers’ proposals or negotiate a contract (they’ve been working without one for over two years) that would preserve their 40 hour work week. So they just keep walking that picket line. Let’s walk with them!!! They’re out there from dawn to dusk every day so you can join them almost any time for an hour or two and be most welcomed. Better still; get a friend to walk with you. What do they want? They want a contract and a guaranteed 40 hour work week. Without the contract there’s no guarantee that their hours won’t be cut back, and more people hired halftime to avoid paying benefits – as so many huge corporations have done and are doing. But they’re a small union and Dignity can ignore them. Let’s show them that we’re not ignoring them. Call dignity Healthcare CEO, Lloyd Dean (who is compensated over $500,000 per month – yes, per month!) And tell him to go back to the bargaining table. His phone number is 415-438-5500. For more information check out the PDC website at www.pdclub.org. “This is to thank you for your column highlighting a reality I have not read or heard about anywhere else in our community. I have experienced as you did the chilling and intimidating feeling one has had on Halloween night on Pacific Avenue in the last few years, a night meant to be scary and fun. But instead, it’s scary and not fun. Floodlit, chain link fenced and military style police-surveillance. This feels like the war in Iraq coming home and all its costly and overpowering machinery with nowhere to go but be sold to local governments who lack trust in its locals to handle potential vandalism and other issues. I would love us see a return to the old way, maybe with a couple cops on the beat with the ability to call for reinforcements. No floodlights, no fences. Having lived in SC for 33 years and watched and participated in many downtown Halloweens, I trust Santa Cruz and I know we can handle problems moderately. Thanks again and hope this issue continues to be addressed”. WORK BEGINS ON ARANA GULCH. (without a permit!) Jean Brocklebank writes.. The City, chomping at the Broadway Brommer Bit, has begun its work at Arana Gulch. A 40′ construction trailer is installed on Agnes Street. Signage at both entrances is posted. Survey stakes for the paved route are in place. Not able to build bridges this winter, apparently they decided to pave the meadow first. The City has decided to proceed without an Incidental Take Permit (ITP) and is doing so based on their faulty logic that the definition of “take” (aka harm or kill) only applies to an actual tarplant above ground. According to the City seed in the soil (seedbank) doesn’t count. With this logic, any land owner could slowly develop “critical habitat” of any annual plant on the endangered species list, as long as there were no plants above ground that were “taken” by development. Eventually the species would have nowhere to go. 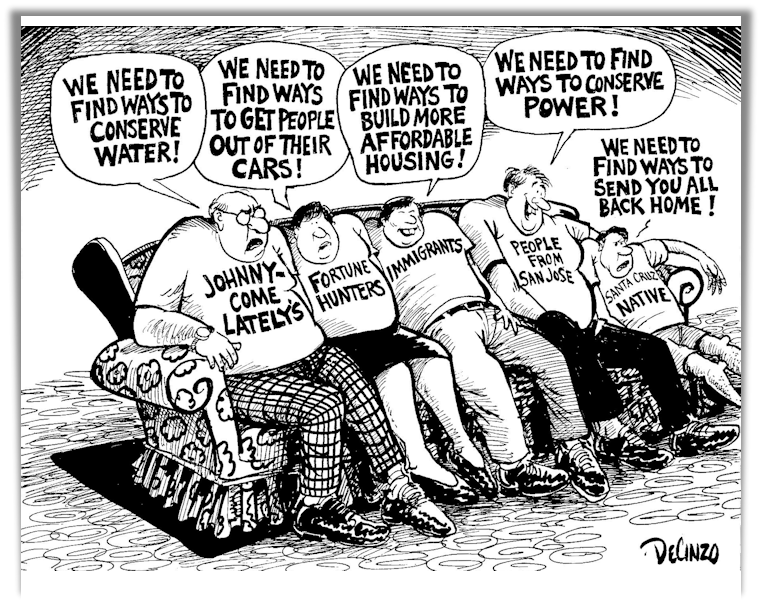 So, the City forges ahead without an ITP, thumbing their uninformed, uneducated, unscientific noses at the world. Because they can”. We need to thank Jean for keeping us abreast of what our City Council is up to. EDDIE IZZARD TALKS ABOUT STONEHENGE. Despite testimony from many members of the public imploring the council to not weaken the Heritage Tree Ordinance and despite a letter from attorney Ryan Moroney of Wittwer & Parkin LLP, on behalf of Save Our Big Trees, advising the council that such changes require CEQA review, the city council majority voted on October 24th to adopt the most draconian of alternatives that expand the grounds for removing heritage trees in the city of Santa Cruz. CLASSICAL DE CINZO. He dissects our local attitudes…scroll down..
EAGAN’S DEEP COVER. 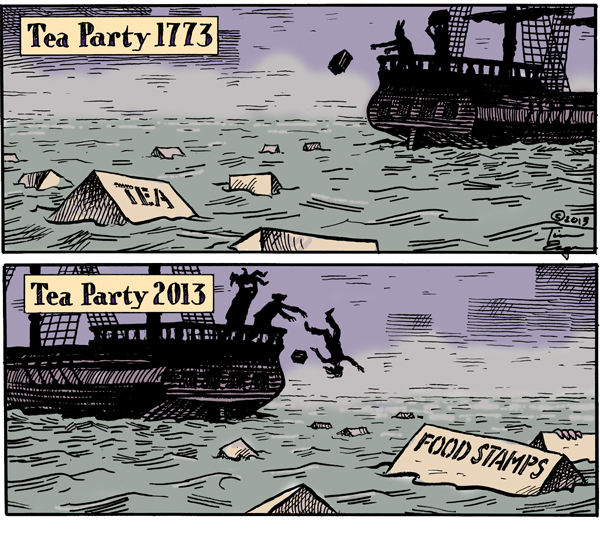 Eagan takes us to a tea party whether we like it or not !!! See below. LISA JENSEN LINKS: Lisa writes: “See what’s cooking at the Jewel Theatre Company’s lighthearted musical revue, Pump Boys and Dinettes, this week at Lisa Jensen Online Express (http://ljo-express.blogspot.com). And even though the new Thor movie mangles mythology, find out why it’s still kinda fun.” Lisa has been writing film reviews and columns for Good Times since 1975. HOW I LIVE NOW & THE PIN. These are two absolutely wonderful films that could only be played at the Nick for a weekend. How I live Now stars Saorise Ronan and is a shocking, beautiful, romantic film about war, survival and dreams and love. You should definitely rent it as soon as it’s available. The Pin is another war film about memories, Jewish traditions and love. It is sad, haunting, and unforgetable. Maybe Temple Beth El will show it in the future. THOR:THE DARK WORLD. Is idiotic, beneath dumb, and of course was the biggest box office smash over the opening weekend…which proves my point. It’s another Marvel Comic Book Hero movie made by The Disney Studios. Chris Hemsworth and Tom Hiddleston, plus Natalie Portman, Idris Elba and Stellan Skarsgard are all fine actors, but good gods… the plot!!!! Oops I forgot that Anthony Hopkins (Odin) and Rene Russo (Frigga) are in it too. It’ s a mess of science fiction, Norse Gods and Natalie Portman running around saying things like “wow” and “gee” to a slew of Gods who don’t know their Asgards from a hole in the earth. BOOKSHOP SANTA CRUZ ANNUAL BIRTHDAY SALE. If you’re a member of Bookshop Santa Cruz’s Readers Club you’re invited to the members only Birthday party Friday night (11/15) starting at 7:30. Yep, ice cream and cake and 20% off storewide!!! But the big deal is that our Hot Damn String Band will again be playing our old favorites, and some of yours too!! We’ve been playing the Bookshop parties for way over 35 years. The Hot Dam String Band consists of Jim Reynolds on guitar, Annie Steinhardt on fiddle, Todd Kimball Mandolin, Dave Magram Banjo, Steve Larkin String bass and as per usual I’ll be playing washboard. Stop by and say hello, have some cake and sing along….and pick up on that book sale. THE HABIT OF ART PLAY (NTL) AT THE DEL MAR. National Theatre Lives’ 2010 broadcast of Alan Bennett’s acclaimed play The Habit of Art, with Richard Griffiths, Alex Jennings and Frances de la Tour, returns to cinemas as part of the National Theatre’s 50th anniversary celebrations. Benjamin Britten, sailing uncomfortably close to the wind with his new opera, Death in Venice, seeks advice from his former collaborator and friend, W H Auden. During this imagined meeting, their first for twenty-five years, they are observed and interrupted by, amongst others, their future biographer and a young man from the local bus station. Alan Bennett’s play is as much about the theatre as it is about poetry or music. It looks at the unsettling desires of two difficult men, and at the ethics of biography. It reflects on growing old, on creativity and inspiration, and on persisting when all passion’s spent: ultimately, on the habit of art. Running Time: 180. That’s Thursday 11/14 @ 7:30 PM and Sunday 11/17 @ 11:00 AM at the Del Mar. “I always like walking in the rain, so no one can see me crying”, Charles Chaplin. “Some people walk in the rain, others just get wet,” Roger Miller. “The only noise now was the rain, pattering softly with the magnificent indifference of nature for the tangled passions of humans,” Sherwood Smith.